Posted in Socks, travelingproject, Uncategorized at May 31st, 2007. Does it count as a leisure activity if you do it at a bar? *Some magazine did a funny charticle that summarized recent freakonmic-like economic theories and rated them by “Likely to appear as an article in Slate” and “Duh factor.” Oh–I just did a google search. It was The New Republic. Here’s the article if you happen to subscribe. ** I looked up all the knitting posts on the Freakonomics blog, and I discovered that Steven Leavitt, the Freakonomist, is the brother of the owner of Yarnzilla, which I have actually ordered from. Apparently, said sister named both Yarnzilla and the philosophy “Freakonomics.” The blog also discussed the whole Socks That Rock Sock Club drama-o-rama. Posted in Uncategorized at May 28th, 2007. 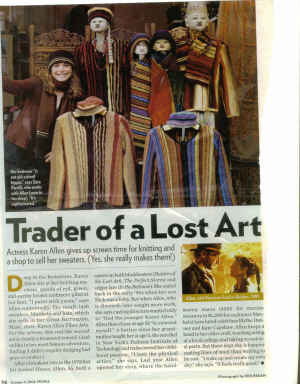 It’s Kate Gilbert’s Equestrian Blazer in the Winter 2006 Interweave. It calls for a 6 needle, but I seem to have a really loose gauge, so even when I knit on a 0 needle, I think my swatch might still be too big! Also. It has gotten really hot here (Memorial Day! The start of summer!) so I’m feeling a little less enthusiastic about knitting with wool. Riding the Cyclone, visiting police precincts, drinking and hanging out. Posted in Sweaters, travelingproject, Uncategorized at May 27th, 2007. Posted in Uncategorized at May 22nd, 2007. Posted in Socks, travelingproject, Uncategorized at May 20th, 2007. Yarn: Trekking. My co-worker gave me this ball of yarn, so I’m not sure about the price and color. Needles: Susan Bates 1s. One set of 5 that I had all year, until last week, when I lost one needle at BAM while attempting to knit while watching The Namesake. Pattern: Classy Slip-Up, in Knit Socks! : 15 Cool Patterns for Toasty Feet, by Betsy Lee McCarthy. In addition to some computer-mouse-gripping issues / bad posture habits, I was knitting the first sock extremely tightly, which gave me tendinitis for a while, and I had to go to physical therapy. But thanks to the physical therapist and improved ergonomic habits , I can now knit socks again. The sock. It went everywhere. Even to the jail called Alcatraz. I don’t know if you can tell, but my gauge got looser over an entire year of knitting. Apparently, I used to knit extremely tightly. I’m not sure I became less stressed, but maybe the sock and I reached a special understanding or something. Also, some action shots of the socks mid-jump. I liked this yarn a lot, and I would use it again. Also, I liked the pattern, and the book Knit Socks! is extremely clear and very easy to follow. Provided that I can conquer my tendency to hold sock needles in a death grip, I would and will make more socks. Posted in Finished Objects 2007, Socks, Uncategorized at May 13th, 2007. Anyway. I have decided that School Products is like the Strand. Like the Strand, School Products is famous and considered a New York icon, and yet, I don’t quite get why the two are so beloved. True, both offer good deals (I bought Twinkle’s Big City Knits at the Strand for 40% off last week) on hard-to-find, expensive stuff (School Products offers yak, camel, and cashmere yarn), but yet I find them both sort of uninspiring. I find the Strand much better since it’s been renovated (I know, heresy to Strand lovers), but it’s still kind of meh. The Strand still has an unwelcoming element to it, I think. I know that School Products has lots of awesome stuff for cheap, but I didn’t feel compelled to buy anything. I think it’s partially because it has a weird office building vibe, with industrial carpeting and overhead florescent lights. Also, I have to admit, I think it’s because it’s not styled very well. That being said, School Products does have a large selection of yarn on cones, many at substantially cheaper prices than at other yarn stores. They are also owned by the same family that produces Karabella yarn and who wrote Runway Knits, so they have the full line of Karabella yarn. I’ve seen a couple products made with Karabella Aurora 8 yarn, and when knit up, the resulting material looks very crisp, if that makes any sense, and seems to have very little halo. Though Grumperina has a bad review of it here, I would still consider it for a future project. Posted in the Business, Uncategorized, Yarn Stores at May 6th, 2007. I was slothing a bit this weekend and surfing the Internet, looking at random knitting organizational stuff* and I went on Lexie Barnes’s website and I found this post, with a still from Desperate Housewives with my bag! Adam gave it to me for Christmas a couple of years ago and I use it all the time. It’s really big, actually, and I use it to drag gym clothes, lunch, a knitting project, library books to and from work a lot, and I’ve also used it as a travel bag. It’s padded, so I can fit my laptop in it, and a week’s worth of clothes. Also, if you happen to put things that spill in your bag a lot, you can wipe it off. All useful qualities. Anyway, via the power of Google, I found out that Felicity Huffman is a knitter, so I’m guessing that might be her own bag that made it into the scene. **If you want to get involved in a controversial handbag discussion, go to Sarah’s blog, where her Dior bag is getting her commenters all riled up! Posted in Uncategorized at May 1st, 2007.